Santiaguito is a dacitic lava dome complex which has been growing since 1922 in the crater left by the catastrophic 1902 eruption of Santa Maria volcano, Guatemala. 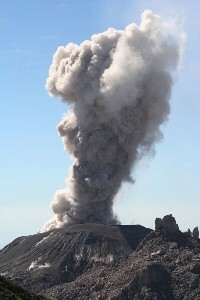 Recent activity has involved small explosions, incandescent rockfalls, emission of block lava flows and dome inflation. Pyroclastic flows generated by collapses at lava flow fronts or resulting from dome collapses have also sporadically occurred. A major indirect impact of activity has been the frequent mobilization of loose volcanic material during the rainy season, which has resulted in numerous lahars (mudflows). These lahars have damaged infrastructure and settlements, notably El Palmar Viejo village 10km downstream of the volcano, which had to be abandoned in 1998. Lahar sediments, which may be many meters thick, can block rivers and change their courses. However, they are themselves easily eroded and massive erosion gulleys scar the landscape between Santiaguito and the pacific coast. 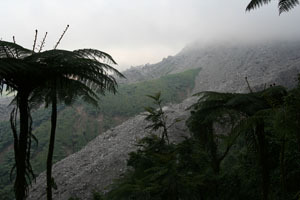 Santiaguito lava dome complex, Santa Maria summit, December 2005. 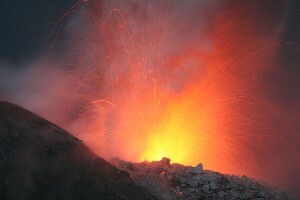 Eruption from Caliente vent, December 2007. Santiaguito lava dome complex viewed from Santa Maria, Dec. 2007. Santiaguito lava dome complex viewed from North, February 2003. Eruptive history at Santa Maria is thought to have begun 30000 years ago, resulting in gradual construction of a 3772m high stratovolcano. Before 1902, the volcano had been in a long period of quiescence and no records of activity existed. In 1902-1903 a large number of earthquakes shook central america. On January 1902, a major quake hit the area around Santa Maria, followed on April 19 by a quake reaching 8.3 on the Richter scale centered at Santa Maria, which destroyed much of the nearby city of Quetzaltenango. On September 23, a similarly powerful quake centered 210km NW of Santa Maria was recorded. In the period running up to the eruption, an average of over 40 earthquakes was being recorded every month in the region. On the afternoon of 24 October 1902, rumbling noises were heard at the foot of Santa Maria and eruptions of steam and ash were observed at the SW flank. 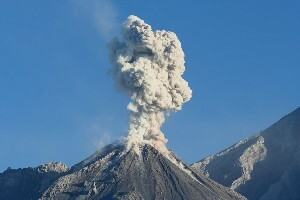 As night fell, a large ash cloud was already rising from the volcano. 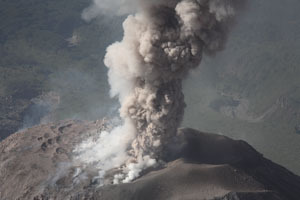 Based on accounts of the type of volcanic rocks raining down on the surrounding areas, it is assumed that the Plinian phase of the eruption commenced at around 1:00 on the 25th of October. 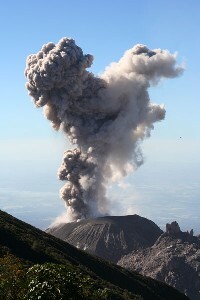 The eruption continued to gather strength and was accompanied by violent seismic activity peaking at 3:00, 7:30 and 11:00. (Note: information about eruption mainly from Williams and Self, 1983 (Journal of Volcanology and Geothermal Research 16:33-56)). The Plinian phase of the eruption lasted for nearly 20 hours and deposited a 30m thick layer of ash and pumice near the volcano. Deposits over 1m thick were found up to 30km downwind (to the NW), and an area of 270 thousand square kilometers received at least 1mm of ash. 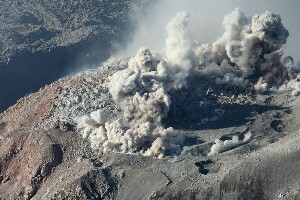 The ash and pumice forms a single fall unit, suggesting that the eruption was driven by a nearly continuous gas blast. The intensity of the blast appears to have increased gradually, until the Plinian phase of the eruption abruptly stopped after 20 hours. A reliable calculation of the column height was made with the aid of a sextant by the captain of the SS Newport which was sailing nearby. A height of 28km was obtained. Other sources suggested a height of up to 48km. Calculations based on the total amount of material erupted (8.6 cubic km of dense rock equivalent) and on the duration of the eruption, provide an estimated average height of 35km (Williams and Self, 1983). Detonations could be heard as far away as Costa Rica, 850km to the SE. 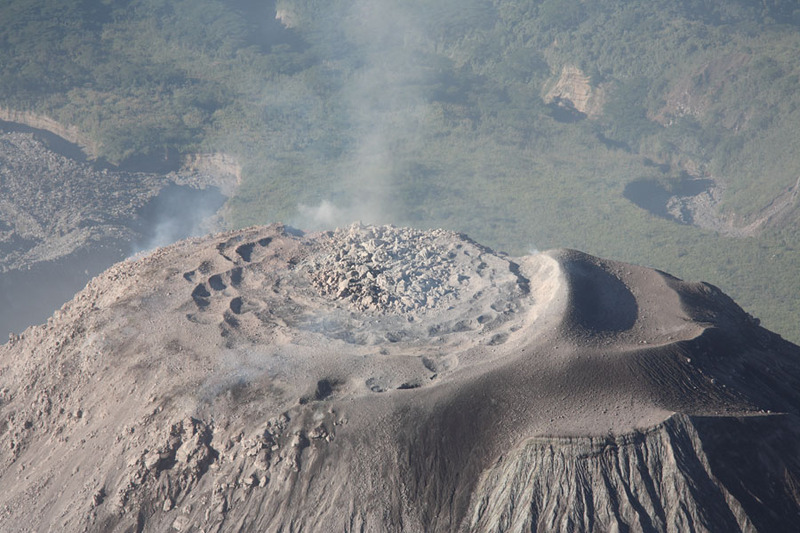 The eruption was one of the largest five in the last 200 years and tore a 0.5 square kilometer crater in the SW flank of the previously symmetrical Santa Maria cone. 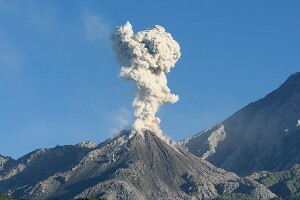 It is thought that over 5000 people perished due to the direct effects of the eruption. Several thousand more died from the malaria epidemic that followed. It is often suggested that the eruption killed the birds in the area, and that their absence resulted in a large increase in the amount of mosquitos. I have not been able to find a reliable basis for this suggestion. Only anecdotal evidence appears to support such a theory, whilst scientific studies on bird or bat control of mosquito populations at other sites have not been able to document any significant effect. Maybe changes in the drainage systems near the volcano resulted in increased amounts of stagnant water in which mosquitos could breed. Huge amounts of deposits were mobilized by rainfall and washed down towards the pacific in what must have been massive Lahars in the following months. Apparently, a 4 square kilometer delta was formed at the mouth of the Rio Samala. The coffee industry in the region suffered huge economic damage due to the ashfall. As for the volcano, after further milder ash eruptions on the following days, it appears that the eruption stopped by the 29th of October. 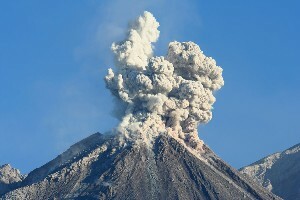 Minor eruptive activity was reported sporadically until 1913. The abrupt end of the Plinian eruption phase is interesting since the end of such eruptions is usually preceeded by a reduction in eruption intensity (in many cases causing lethal column collapses). It is suggested that the conduit may have been blocked by a collapse of its walls before the magma chamber had been exhausted (the chamber is thought to lie very deep as no caldera was formed inspite of the eruption of many cubic kilometers of material). This theory is supported by the observation that the Santiaguito dome is constructed from essentially the same magma as the 1902 pumice. 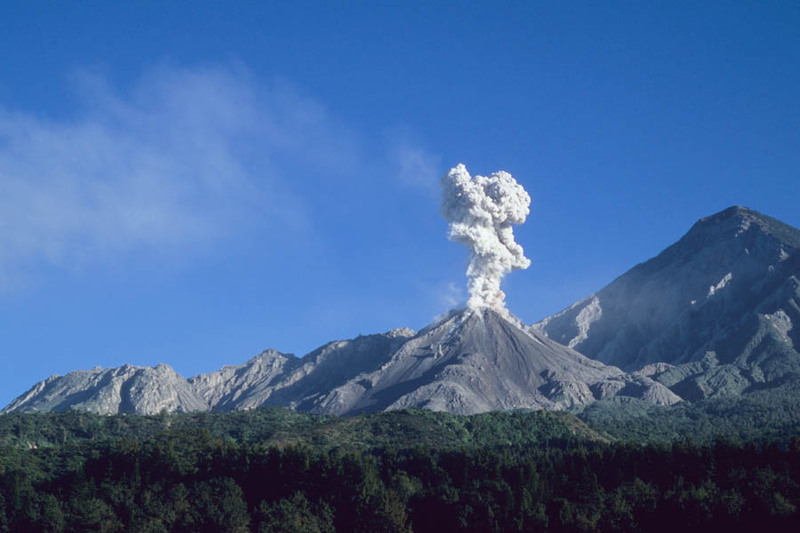 Hence, the eruption of Santiaguito may even be regarded as the final phase of the 1902 eruption. Ash / steam eruption from Caliente vent, December 2005. Eruptions were occuring up to 3 times per hour during observation period. Ash / steam eruption from Caliente vent, December 2005. Note the distinct ash-rich and stream components. 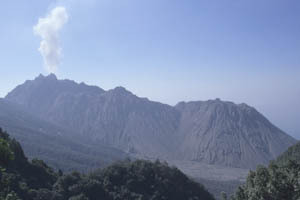 Start of eruption from Caliente vent, December 2005, viewed from Santa Maria. Eruption mechanism is illustrated in detail further below. Santiaguito Caliente dome viewed from Santa Maria summit, December 2005. Note block flow in top left of image. Block flow on SW flank of Santiaguito, December 2005. Caliente dome is covered in clouds as usual at midday. The onset of the construction of the santiaguito lava dome complex was marked in 1922 by observation of lava extrusion in the center of the 1902 crater. The complex today comprises 4 main structures known from East (S. Maria side) to West as Caliente, La Mitad, El Monje and El Brujo. From 1922-2000, 8 distinct cycles of high lava extrusion (lasting about 3-5 yrs) followed by low extrusion (10-12 yrs) have been distinguished (Harris et al., 2003 (Bulletin of Volcanology 65:77-89)). Extrusion in the first cycle (Caliente I (1922-1929)) was highest, reaching 2 cubic meters/sec. The following cycles were (2) Caliente II (1929-1939), (3) La Mitad (1939-1949), (4) El Monje (1949-1958), (5) El Brujo (1958-1972), (6) El Brujo & Caliente III (1972-1986), (7) Caliente IV (1986-1996) and (8) Caliente V (1996-?). During cycles 3-5, new domes were emplaced in an increasingly westward direction, further from the main vent which is assumed to lie under Caliente dome. This trend was reversed in the 6th cycle when both El Brujo and Caliente were active. 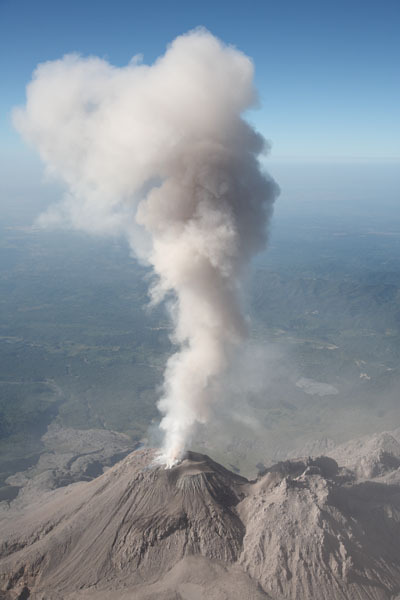 The return of activity to Caliente has been accompanied by a decline in maximum extrusion rates since cycle 5 and may represent a decrease in the pressure driving the eruption and a resulting inability to maintain extrusion at lateral vents. Silica content and thus viscosity of lava erupted since 1970 has also been in steady decline and may reflect eruption of material from a deeper source, suggesting possible chamber exhaustion (Harris et al., 2003). 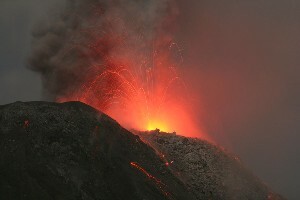 Nighttime eruption of Calient Vent. Viewed from inactive El Brujo dome, December 2005. 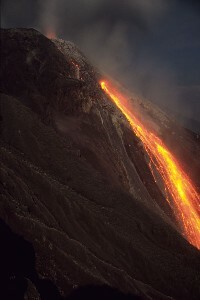 Nighttime eruption of Calient Vent with incandscent rockfalls. Viewed from El Brujo dome, December 2005. The cyclic activity has been punctuated by a number of interesting events which deserve mention at this point. 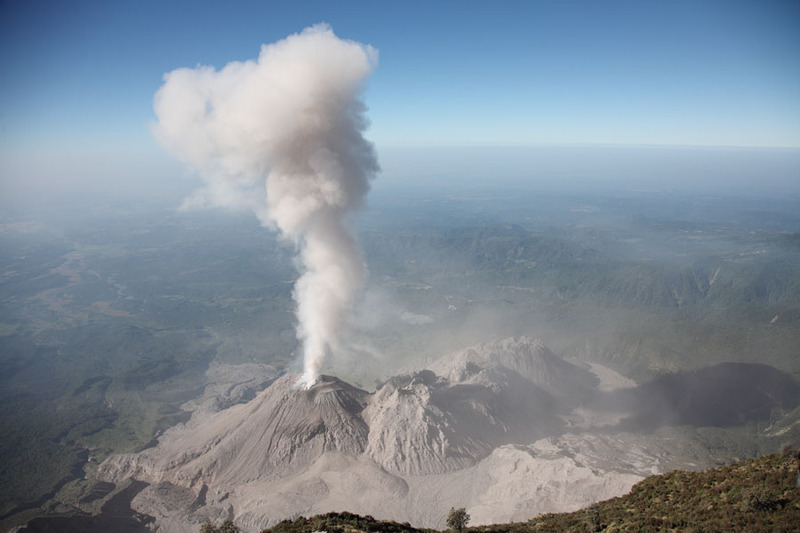 From 2-4 Nov. 1929, hot clouds of blocks and ash (pyroclastic flows) extended up to 10km from Santiaguito killing many hundreds, if not thousands, of people. Large pyroclastic flows (PFs) were repeatedly witnessed in 1929-1934, after which this kind of activity died down. 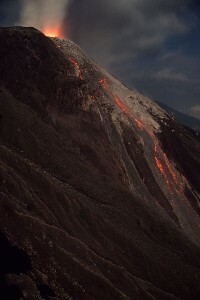 A violent eruption in 1973 caused a 4km long PF. 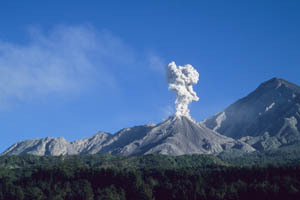 A 5km PF was reported in 1989 in an eruption involving a lateral blast. This 19 July eruption marked the onset of a period of major unrest at Santiaguito. In 1990, multiple episodes of explosive activity involving lateral blasts and PFs with runout distances of up to 7km occurred. Sadly, on 19 July 1990, a lateral blast killed 4 hikers climbing on the E rim of Santa Marias 1902 crater 1km from the Caliente vent. Activity in recent years has been more subdued. 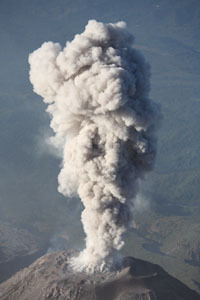 However, on 26 April 2010, an 8 km high ash plume was produced by an unusually powerful event, with ashfall causing some disruption in several provinces downwind (to the NW). Whether this marks the onset of a new major eruption remains to be seen. 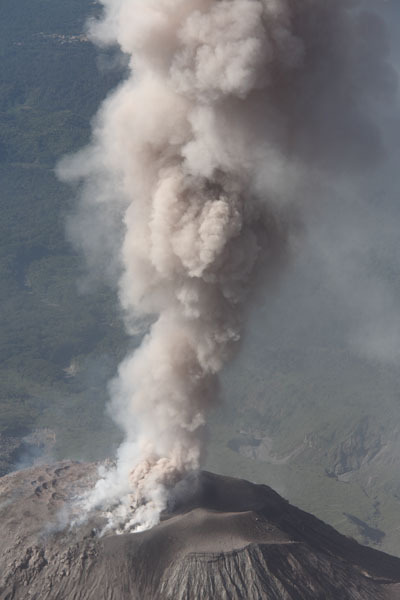 Since the summit of Santa Maria provides an ideal vantage point, it has been possible to observe the vent dynamics of Santiaguito in some detail. Two types of distinct activity were observed on the same days when the volcano was visited in 2005 and 2007. Firstly, emission of ash and incandescent fragments primarily from a single vent region accompanied by a loud aircraft-engine like noise which could last for several minutes. Secondly, explosive eruptions of ash and initially incandescent fragments from a ring-shaped fracture could occasionally be observed. This form of activity is discussed in Bluth and Rose 2004 (J. Volc. Geotherm. Res. 136, p.297-302) and is attributed to preferential production and accumulation of gases at the conduit boundaries. The images and animation below illustrate these different eruption types in detail. 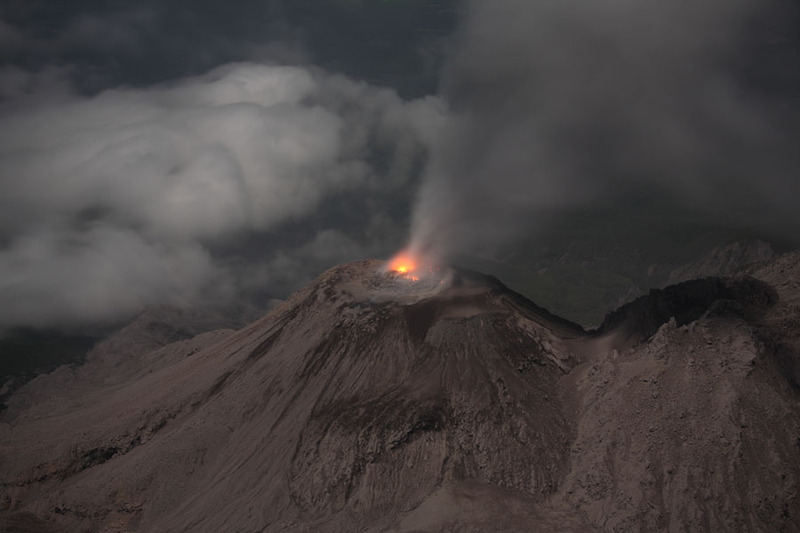 Nighttime eruption of Santiaguito from vent(s) at back part of crater. Accompanied by load roaring noise. Closer view of a nighttime eruption of Santiaguito of similar type to that shown on image to left. Summit of Santiaguito Caliente dome. Note blocky area in top right of summit plateau. Nighttime view of Santiaguito Caliente Dome from Santa Maria. Areas of consistent incandescence are visible. 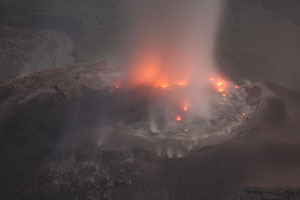 Onset of ring fissure eruption. Note that ring corresponds to perimeter of blocky area in picture above which marks top of magma column. 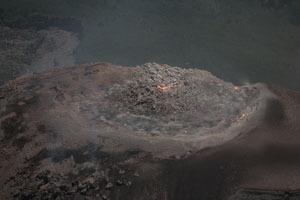 Eruption of vent at perimeter of ring structure. This vent also strongly contributed to ring fracture eruptions (see animation below). 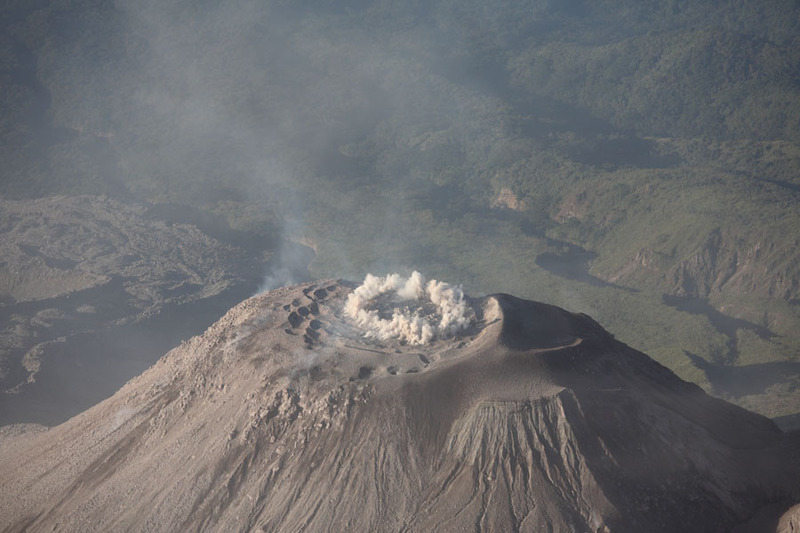 Animation of characteristic Santiaguito ring fissure eruption. 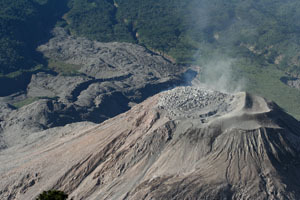 A further interesting feature of the activity of Santiaguito has been the emplacement of a number of block lava flows. Due to the viscosity of the silica-rich dacite lava, these massive (in places over 30m thick) flows are gradually extruded and move slowly downhill over periods of months or even years. First major block flows were observed in cycle 5 (reaching up to 2300m from the dome), followed by up to 2150m and 3600m long flows in cycles 6 and 7, respectively. Collapses of the massive flow front can cause dangerous pyroclastic flows. 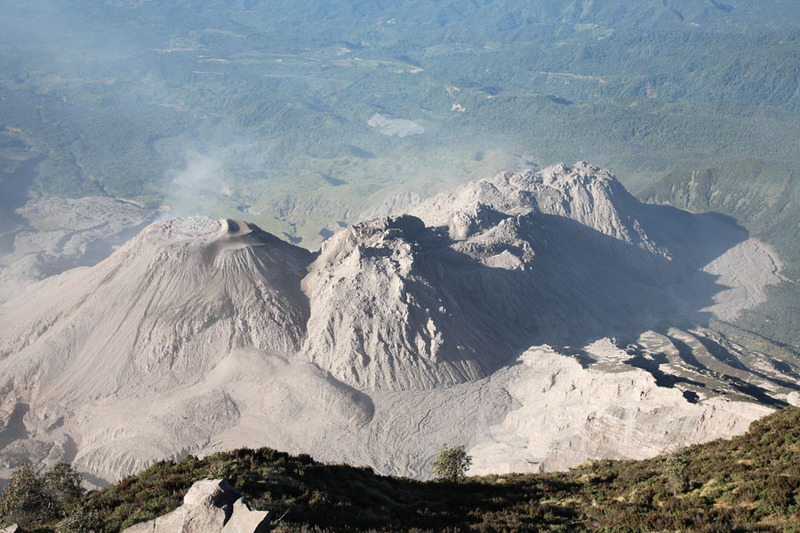 The summit of Santa Maria provides a birds-eye view of activity at Santiaguito. Alternatively, viewpoints exist to the North. Approach from the South is complicated by private fincas and numerous inpassable deep erosion gulleys. Climbing on El Brujo Dome is possible via a Northerly approach, but a guide is absolutely necessary to find the route. Clearly, this is dangerous and rarely offers better views than the other locations mentioned. Recently, even climbing onto the rim of active Caliente dome has been offered. 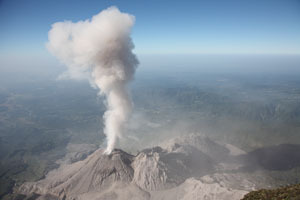 Further Guatemalan volcanoes are introduced in the sections on Fuego and Pacaya.